WEC Group has acquired £7m Rotherham Facility to strengthen operations at MTL Advanced. WEC Group has acquired a 300,000 sq. 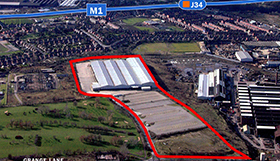 ft. factory and 30 acres of land as a way of strengthening operations at its Rotherham-based site, MTL Advanced. Steve Hartley, WEC Group Managing Director commented: "The acquisition of the facility is a considerable addition to the Group's assets portfolio which will give us a long term competitive advantage. It also gives us much needed room for future expansion." Originally built in 1990 as a former distribution depot and lorry park, the sizeable property was converted for industrial use in 2010 and is in fact larger than WEC's seven other manufacturing facilities grouped together. It has raised WEC Group's overall manufacturing floorspace to over 500,000 sq. ft.
Richard Clithero, Associate Commercial Property Solicitor at Forbes Solicitors, commented: "This site is a substantial facility and the acquisition represents a real commitment to the area by WEC Group. "With this purchase following on from the acquisition of the MTL business, it is great to see WEC Group going from strength to strength." WEC Group's investment rush was kick-started in February last year with the multi-million pound acquisition of MTL, which brought the Yorkshire company out of administration and saved 135 jobs. Under WEC's leadership, MTL is already showing strong signs of recovery with month-on-month profitability and with 55 new jobs created since the acquisition. The company has also won several multi-million pound export contracts for the Defence industry as a result of new capital equipment. Group Commercial Director, Wayne Wild said the first twelve months following the partnership deal had seen a significant amount of growth and development: "MTL is continuing to move forward in the right direction and we have got some very large contracts in the pipeline. The acquisition of the Grange Lane facility will give us a better control of our cost base and will pave the way for future success." WEC Group's growth ambitions aren't however limited to MTL Advanced, as other areas of the business have also received substantial investment as part of the ongoing expansion plan. This includes over £2.5m of investment in capital equipment such as the latest CNC machining and waterjet cutting technology at the Group's Blackburn sites, as well as further investments at the new Darwen-based Powder Coating division. These continuous investments in new technology and manufacturing facilities have been key to WEC Group's success since acquiring MTL Advanced. The company has managed to achieve 48% growth in turnover and raised staff from 445 to 640 in just 12 months.